The Blue Jays’ 2018 season has come to an end. It was a difficult summer for baseball fans in Toronto, but that doesn’t mean there weren’t some enjoyable moments at the Rogers Centre this season. Would it have been a more enjoyable ride with Vald Guerrero Jr. along for the trip? Probably, but that’s a topic for another day. With another year in the books, here are some of the most surprising statistics from another season of Blue Jays baseball. This season, the Blue Jays led the major leagues in hitting pop ups with a 12.2 percent infield fly ball rate. Sometimes it felt like Yangervis Solarte was responsible for all of them. He wasn’t, but he was responsible for a lot of them. His 19.2 percent infield fly ball rate was tied with Mike Moustakas for the highest among all qualified hitters. Kevin Pillar wasn’t far behind at 17.7 percent – good for fifth highest. Because pop ups are easily turned into outs at the major league level, they are the least desirable batted ball outcome a hitter can produce. This high level of infield fly balls could also help explain why the Jays ranked so low in terms of batting average on balls in play (BABIP). The Blue Jays’ team BABIP of .286 was the fourth lowest in the major leagues. The Blue Jays emerged as one of the most likely teams to be shifted on this season – with 26.2 percent of pitches thrown against them coming with the opposition’s infielders playing in an exaggerated defensive shift. Only the Angels and Rangers’ hitters saw more defensive shifts. What’s surprising about this is that so many of the Blue Jays’ best hitters were either right-handed or switch hitters – who are more difficult to shift against since the first basemen still needs to stay on the left side of the infield to cover first. Luckily for the Jays, the damage was somewhat mitigated. The team’s batting average against the shift was .253 – sixth highest in the major leagues. With 28 games started, Marco Estrada took the ball more than any other Blue Jays’ starter this season. Unfortunately, his 5.64 ERA was the highest of any Blue Jays’ pitcher that remained with the team all season long. While Estrada struggled to generate the results that made him one of the Jays’ best pitchers in 2015 and 2016, he was certainly not alone. Surprisingly, the starting rotation was a perceived to be an area of strength heading into the season and ended up being a glaring weakness. Marcus Stroman (5.43), Aaron Sanchez (4.89), Jaime Garcia (6.16) and Sam Gaviglio (5.43) all struggled to limit runs. This led to a starter’s ERA of 5.14, third highest in the major leagues. Only the Orioles and Rangers had higher ERAs from their starting pitchers. With J.A. Happ gone and Marcus Stroman and Aaron Sanchez still struggling with injuries, the offseason will be an interesting one. Don’t be surprised if the Jays add a starting pitcher or two via trade or free agency. Remember the 2015 team that mashed homers and refused to play small ball? Some even (I believe wrongly) suggested this was the reason for their defeat at the hands of the Kansas City Royals. That 2015 Blue Jays’ team were also eleventh in baseball with 88 stolen bases. Since 2015, no Blue Jays’ team has managed to swipe more than 54 bags. This year’s team, which was younger and more athletic than the 2016 and 2017 teams, still only managed to steal 47 bases – the third lowest total in all of baseball. And it’s not because they’re getting caught a lot. The Blue Jays rate of 0.48 stolen base attempts per game was the fourth lowest in the majors – even with the influx speed that came in the form of Randal Grichuk, Lourdes Gurriel Jr., Teoscar Hernandez, and Dwight Smith Jr. In an era where baseball is moving away from utilizing the stolen base, the Jays still appear to be near the very bottom of the league when it comes to swiping bags. Is that why Ross Atkins wanted to get rid of John Gibbons? Nah. But why get younger and more athletic if you aren’t gonna use it? Despite the lack of team stolen bases, the Blue Jays do appear to be more fleet of foot than in years past. It might not surprise anyone that Gurriel Jr., Grichuk, or Dwight Smith Jr. are some of the Jays’ fastest players. It probably will surprise you to know that catcher Danny Jansen is. Jansen’s sprint speed of 27.9 feet per second was sixth best on the team and fourth in all of baseball among catchers (with at least 10 opportunities). Ah, to be 23. Earlier this year, I mentioned that the Rogers Centre hasn’t lived up to its reputation as a hitter friendly ballpark in recent seasons. The Rog Mahal as some more clever than me have lovingly dubbed it, graded out as a bottom third run scoring environment in both 2015 and 2017. This trend continued in 2018, when the Rogers Centre was only the 20th best run-scoring environment in baseball according to ESPN’s park factors. Baseball Prospectus, which breaks down its park factors by batter handedness, produced similar numbers – grading the Dome as the 23rd best park for left-handed hitters, and 20th for righties. The Blue Jays drew more fans than any losing team other than the San Francisco Giants. And the Giants have garlic fries. (I’ve heard that AT&T Park is a bit nicer than the Rogers Centre, too) Despite a second non-competitive season in a row, the Jays still ranked fifth in the American League (thirteenth in the majors) in total attendance –ahead of playoff contenders in Cleveland, Philadelphia, and Arizona and the major market New York Mets and Texas Rangers. The Jays also ranked a respectable thirteenth in average attendance. All and all, 2,325,281 fans still made it down to the Rogers Centre this season. Does this make it frustrating when you hear things about the Blue Jays’ front office or corporate ownership making decisions to save money or not re-invest in the team? It sure does. Is there anything fans can do to change this? It sure doesn’t seem like it. Why do you keep mentioning Dwight Smith Jr. as having good speed? A quick glance as statcast sprint speed shows this to be anything but true, as he measures at a mediocre 26.4 ft/second. This is in fact below average! Thanks for reading! The Statcast data is surprisingly low but I based my comment on him being graded as an above average runner in prospect reports and that he has stolen as many as 25 bases in the minors before (although he’s dipped into the teens in truncated high-level minor league seasons). Sorry if I came across as angry, gotta be a good polite Canadian now : ). 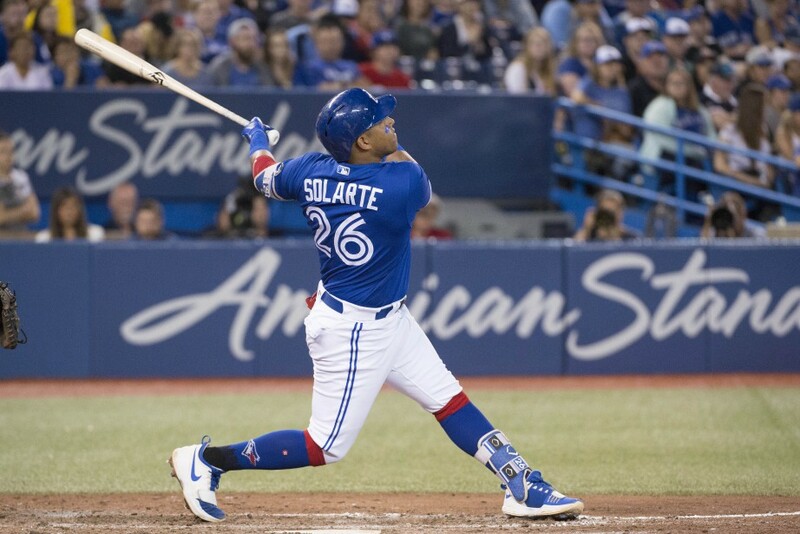 I just find it puzzling that people keep mentioning DSJ as a possible future Jays outfield candidate, as he doesn’t have any particularly good tools aside from a decent hit tool. He is slowish, has very little power, didn’t look like a very good defender from limited viewings the last few years, and has a weak throwing arm to boot. Not sure where the potential lies with this guy really. Oh don’t apologize at all! I’m happy to chat about anything I write and you brought up a really interesting point. For reference, Danny Jansen, who posted a 27.9 ft./s sprint speed graded as a 30 runner in FanGraphs’ prospect reports. DSJ (26.4) graded out as a 55 (both on the 20-80 scale). Part of me wonders if given their limited action they haven’t timed enough “competitive runs” and that’s why Jansen looks fast and Smith Jr. slow? But I do totally agree with you – he’s got a decent ability to make contact, but aside from that it seems like there would need to be a lot of skills improvement before he should be considered a starting option. Interesting idea on the low number of competitive runs, but they both are in the mid 30 range for total number of runs at this point, so both guys have had a similar number of opportunities to flash their wheels. I do like how the number of below average runners the Jays have this year compared to the last few years, it is depressing watching a team full of guys who run like they have pianos tied to their backs. ; ) I think a cool upgrade to the statcast metric would be an acceleration value, as well as an average speed metric, this would give a more true measure of the players functional speeds all the time rather than just the maximum speed they are able to reach in small bursts. ATW Episode 121: That’s a Wrap!